Now with real-time collaboration, tabbed document viewing, and one-click document combining. Nuance Power PDF Advanced has been one of our favorite Acrobat alternatives. 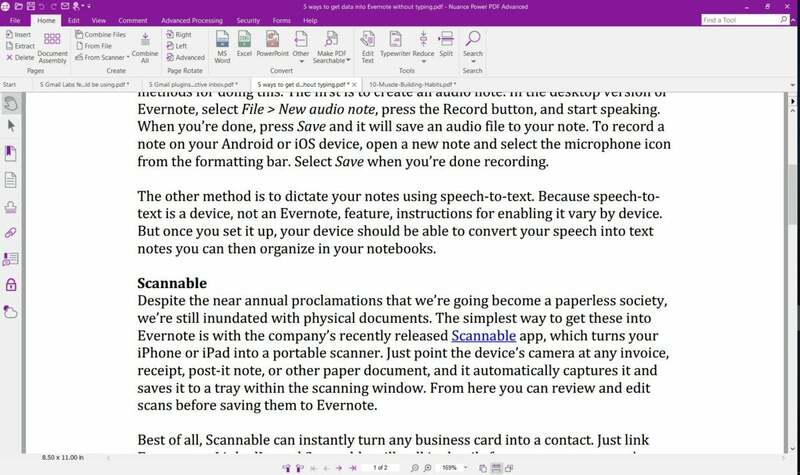 It boasts a comparable set of annotation and markup tools laid out in an intuitive Office-style interface, allows you to control access to sensitive content, and integrates with Microsoft’s productivity apps so that you can turn Word, Excel, and PowerPoint files into PDFs from the Office toolbar. 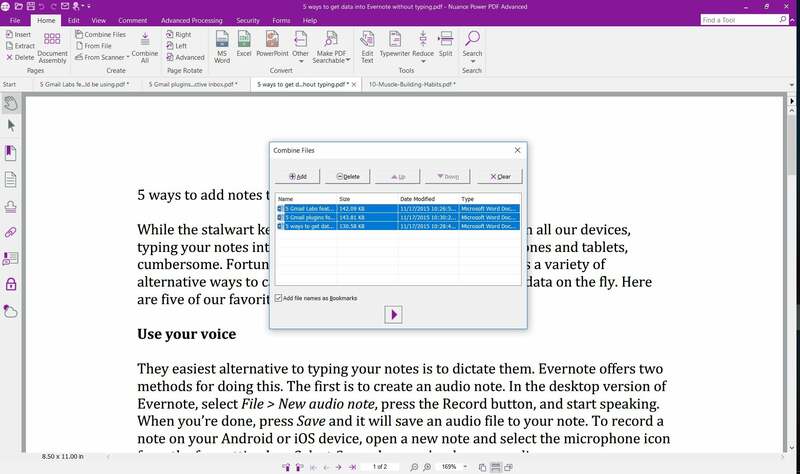 It even leverages Nuance’s Dragon Notes, allowing you to dictate your comments into a PDF instead of typing them. Building on that solid foundation, version 3 adds some significant updates. One of the first you’ll notice—and appreciate—is tabbed document viewing. You can now open multiple files within a single pane rather than in individual document windows. It’s hardly a radical idea but certainly a welcome one as you no longer have to shuffle through a stack of PDFs to find the one you want. You can now combine all currently open documents into a single PDF with a button click. The most important addition as far as business users are concerned, though, is the new collaboration capability. Previously, if you wanted to work with others on a document, you had to share the file via email or a third-party cloud service like Dropbox, then the recipient would have to make their changes, rename the file and send it back the same way—and so on until you arrived at a final draft. It’s an unwieldy way to collaborate and prone to version control problems. 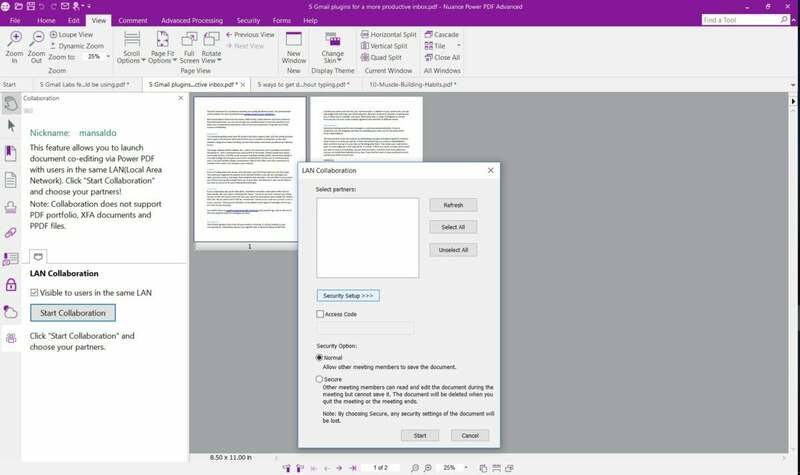 Now you can invite partners to collaborate on a document from within Power PDF using a Collaboration Panel that’s been added to the right toolbar. Participants can co-edit a document and see each other’s changes—each person’s cursor is distinctly colored and labeled with their nickname—in real time. You can also follow a particular collaborator’s activities in real time by clicking on their nickname and selecting Follow View. The only rub with this feature is that all participants have to be on the same local network. That means remote collaborators will still have to use to the tiresome collaborate-by-email method. Power PDF Advanced 3 adds a real-time collaboration feature, but all participants need to be on the same network to use it. One major reason people turn to a PDF editor is the need to combine multiple documents into a single PDF. This has typically been an arduous process, even in Acrobat, requiring to you open, drag, and order the individual files, one by one. Power PDF 3 adds the ability to combine all currently open PDFs into one PDF with a single button click. It’s a huge time saver when you’re creating multipage reports and other long documents. Nuance has also added support for ISO PDF 2.0 , the next-gen PDF standard introduced last year, as well as DocuSign eSignature support so users can sign and send documents as part of a secure workflow directly from the PDF interface. It has also improved document conversion, though you’re unlikely to notice as conversion errors were rare in the previous version. Power PDF Advanced 3 is available for Windows at $180 per copy. Volume licensing is available for large organizations. A Standard version that omits some enterprise features like redaction and eSignatures is $130. There’s still no separate mobile app, but the desktop version is optimized for use on touchscreens. Power PDF Advanced 3 significantly improves an already sophisticated PDF editor. While we’d like to see the collaboration feature able to incorporate remote workers, this feature is still reason enough alone to consider purchasing this upgrade. Power PDF Advanced is one of the most capable and affordable Acrobat alternatives. Even if you're a current user, version 3 is worth the upgrade.